Our Lansinoh® ULTRA THIN, STAY DRY NURSING PADS with BLUE LOCK™ Core hold 20x their weight in moisture and have a unique waterproof layer to help you stay dry day or night. 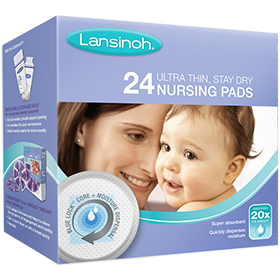 Lansinoh® ULTRA THIN, STAY DRY NURSING PADS are comfortable and stay securely in place with two non-slip adhesive tapes. Our Lansinoh® ULTRA THIN, STAY DRY NURSING PADS are super absorbent, designed to hold shape and can hold up to 20x its own weight in moisture. BLUE LOCK™ Core quickly captures and disperses moisture evenly, while the unique waterproof layer keeps clothing protected to help you stay dry. The discreet, naturally contoured design means that you don’t have to worry about bunches or crinkles, and the pads are super soft for maximum comfort. Each pad stays securely in place with two non-slip adhesive tapes and fits all breast sizes. Each pad also comes individually wrapped for convenience and hygiene – perfect to slip into a handbag or nappy bag! Why are your pads so absorbent? The effectiveness of the Lansinoh® ULTRA THIN, STAY DRY NURSING PAD lies in the construction of the product and the materials used in the production process. Through a unique process using heat and air, paper pulp is converted to “fluffy pulp”, which is then combined with a super absorbent polymer in the form of a powder. This mixture is sandwiched between layers of paper tissue. A non-woven fabric is then placed over the tissue to provide a stay-dry lining. This lining draws breastmilk and moisture away from the skin and into the core of the pad where it is absorbed by the super absorbent polymer, which turns into a gel. The layers of tissue surrounding the polymer further ensure that the moisture is locked within the core of the paper pulp and polymer. This unique action keeps both the mother’s skin and her clothing dry. 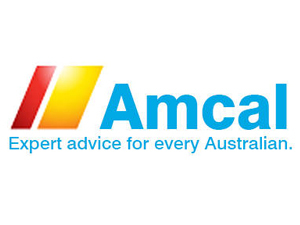 My baby chewed on the pad and the gel came out – what should I do? 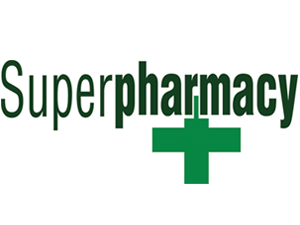 The material that is used to absorb the milk is a Super Absorbent Polymer (SAP). It is similar to what is in baby diapers, in that it starts as a powder and once the milk hits it, it turns into a gel. The SAP is non-toxic, however, it of course is not meant for ingestion. If you do think there is a possibility that your baby did in fact ingest some of the polymer, contact your doctor and/or your local Poison Control Centre. Why do you individually wrap each nursing pad? Isn’t that bad for the environment? We individually wrap each pad because it keeps each pad clean and hygienic and allows you to toss them in your bag without worry that they will not be sanitary when you use it. 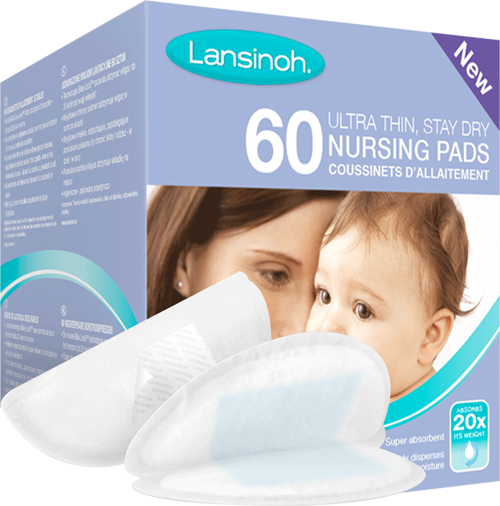 Are Lansinoh® ULTRA THIN, STAY DRY NURSING PADS recyclable? While there are components in the pads that are recyclable, the intact pad is not recyclable. 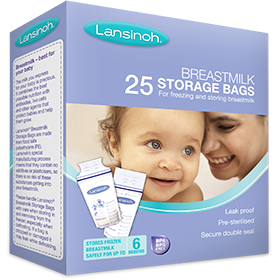 Why are Lansinoh® ULTRA THIN, STAY DRY NURSING PADS so large? The shape of the pad allows for full coverage for maximum discretion under clothing. Also, the wider area allows for more absorption as the Super Absorbent Polymer is spread over the entire surface of the pad. Can I sleep with the pads in? Yes, many mothers find our pads very absorbent, especially at night. 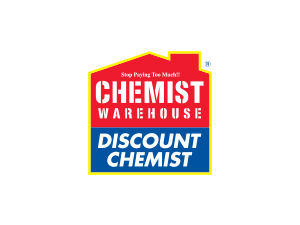 We recommend changing the pads during the night if they become saturated.